Rajeev holds a PGDM from IIM, Calcutta (1996) and a B. Tech. (Hons.) in Civil Engineering from IIT, Kharagpur (1994). 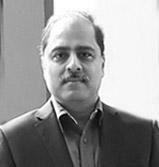 Rajeev joined Pluss as an investor and CFO and advises across strategy, finance and growth path for the organisation. He works closely with the Managing Director to chart out the future strategies for growth. Rajeev started his career with Godrej Consumer (then Godrej Soaps Ltd.) as a Management Trainee. Subsequently, he was deputed to Godrej Properties Ltd. Where he managed their Treasury and set up their procurement and contracting department from scratch. He moved on to Johnson & Johnson Medical India where he worked for 12 years across departments – manufacturing, marketing, supply chain and finance holding various positions for their India and South Asia business. Subsequently, he joined Covidien as their India Finance Director. Covidien was acquired by Medtronic and he worked at the new venture for 5 years as their Chief Financial Officer with additional responsibilities of Business Unit head for the the critical care business segment. As a business partner and business head, he had been deeply involved in multiple new product launches, business turnarounds and successfully executing organic and inorganic growth strategies.